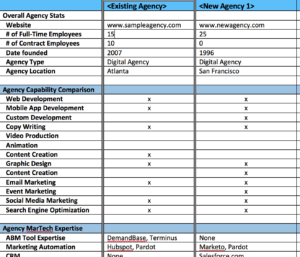 I’ve worked with some of the top content marketing agencies on the planet. Sadly, I may also have seen some of the worst. There are a few things that set them apart. One of the most undeniable differences is the agencies understanding of the buyer’s journey, and how to align content to each of the stages. The underlying principle behind this is the desire to create content that supports what the buyer wants no matter where they are in their search, as well as to guide them down a path to purchase. Let us take a moment to define the buyer’s journey. 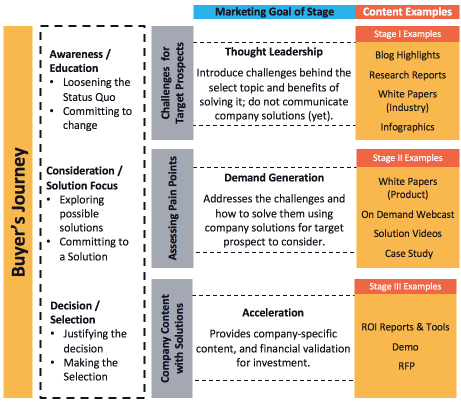 First off, this is the general journey any buyer takes when buying a B2B solution. I won’t spend much time defining it here (others have done it before), but if you want to read up on it, this blog does a pretty good job. What you’ll notice is that marketing’s goal changes with each of the stages. As such, the types of content you introduce to your target audience at each stage should change as well. The agency should understand which content that your target audience is most apt to digest at each stage. The above image highlights common ones for your consideration, but your agency (and you) should do the research to see what works for your market/industry. The net is that your goal should always be to engage prospects at the right level with content that is correctly positioned for the stage that the buyer is within. When selecting an agency, ask them about their POV on the buyer’s journey. Test them to make sure that they get it (most will say they do), but then drill in deeper and ask them to explain the alignment to content and to show examples of creative they’ve used. Better yet, ask them for a content map that is aligned to the buyer’s journey that they’ve done with other clients. Want more? Check out this article on the top 5 reasons to outsource content marketing to an agency.